The phrase “timing is everything” is relevant in a lot of situations, including planning orthodontic treatment for your children. It can be overwhelming to try and anticipate if, when, what kind of help your child will need to keep their smile straight and their mouths fully functioning. With a wealth of information available on the subject, it is easy to get confused by so much well-meaning advice, but this does not have to be a stressful experience! Frey Orthodontics would love to give you a better understanding of what a long-term plan for your child’s orthodontic care might look like. When working towards a straighter, healthier smile for your child, the first step should always be an initial evaluation with an experienced orthodontist like Dr. Frey. The American Association of Orthodontists recommends that all children have their first orthodontic consultation by the age of seven, and we agree. This guideline gives us the chance to find and diagnose many common dental issues before they have a chance to become more serious and require more intensive treatment. Being proactive with your child’s oral health can be summed up by the idea of two-phase treatment, a specialized service we offer for younger patients we believe will need orthodontics as they grow. We are going to take a look at what this kind of early intervention involves, and how it can benefit your child’s smile in the long run. Keep reading to learn more! As the name suggests, two-phase treatment is a process during which a child will receive orthodontic treatment at two separate times, with a break in between. The first phase of treatment will generally begin when the child has a mix of both primary and permanent teeth. There is then a period of rest before the second phase starts, usually, once the child has most or all of their adult teeth. Although we may sometimes use braces or other orthodontic appliances during the first phase, this will depend on the specifics involved with each individual case. Braces or aligners are used more often in the second phase of treatment. The first phase of orthodontic treatment will normally be initiated in order to take advantage of the predictable stages of dental development. When we follow the patterns of normal childhood growth and development, we have the best chance to improve and correct orthodontic issues early on. Many common dental problems can be treated relatively easily in a growing child, but as they get older and the jaw bones stop growing, these same issues may require more invasive treatment. While early treatment can achieve lasting results for many issues, and lessen the impact of others, most patients will still require a second phase of treatment in order to complete the alignment begun with the first phase. Before you can truly understand the way two-phase treatment works to benefit your child’s oral health, you need to know the ins and outs of each phase, as well as what goes on during the resting period that happens between them. Phase one treatment can help a child’s jaw develop to better accommodate all the permanent teeth, as well as improve the way the upper and lower jaws fit together. This method of treatment can benefit patients in many ways, from an improved ability to bite and chew to reducing the risk of damaged teeth due to crowding, misalignment, or malformed jaws. This first phase of treatment contributes to longer-term stability, meaning the teeth will stay in whatever position our orthodontists move them to. The second phase of treatment continues this stabilization by moving the teeth into their final improved positions. But before this phase is initiated, there will be a period of time where the permanent teeth are emerging. For this, we pause orthodontic treatment in order to let the teeth, jaws, and mouth have a temporary break. After a successful first phase treatment, there will be enough room for the remaining permanent teeth to have a clear eruption path. The teeth that have been moved will be stabilized with either a space maintainer or fixed (non-removable) type of retainer. The second phase is where everything begins to come together! This step will usually be initiated once your child’s permanent teeth have erupted, and it will often require braces or clear aligners to be used for a time. When a child’s orthodontic treatment is complete, retainers will be necessary to ensure their newly straightened smile stays that way. Orthodontic treatment is never a “one size fits all” solution to oral issues. What works for one child may not work for another, so it is important to find an experienced orthodontist who will customize a treatment plan for your child based on their specific needs and goals. 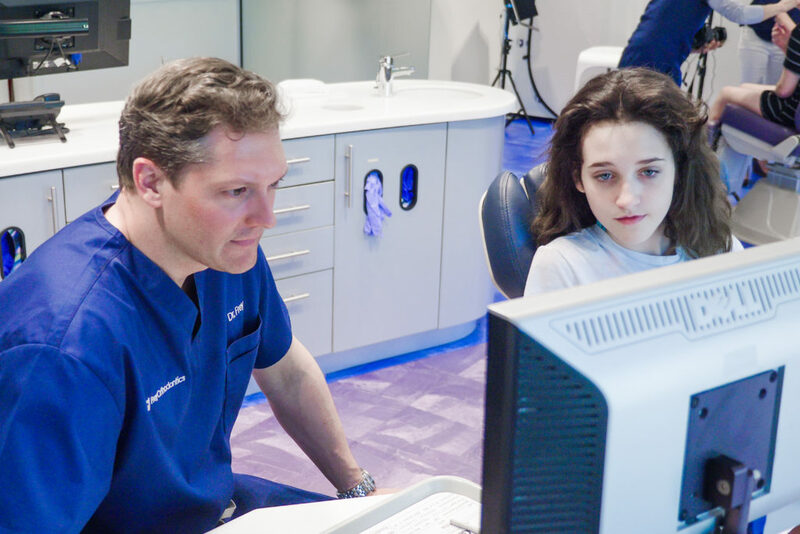 Dr. Frey is dedicated to providing individualized care and the highest-quality orthodontic treatment to every patient he sees. If you are in Algonquin, Naperville, or any of the surrounding communities and want to learn more about how two-phase orthodontic treatment could improve your child’s smile, get in touch with us today. Our talented team is here to give your child a beautiful, bright, healthy smile to last a lifetime!